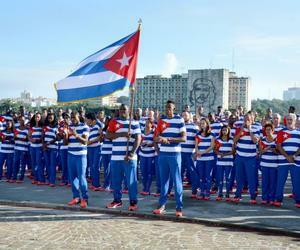 Preparation of Cuban athletes installed at the villa and other training bases marches as conceived for the stage prior to the start of 31st Olympiad. That was the assessment by the head of the Cuban delegation when analyzing the balances of the first few hours of stay in the enclosure and the reports received from the other scenarios where training is completed. The facility built for the Games welcomes competitors who arrived on July 27 from Havana, plus weightlifters Yoelmis Hernández (86 kg) and Marina Rodriguez (62) and the boxing squad under Coach Rolando Acebal, who arrived before to the South American country. The preparation of Cuban athletes takes place in different scenarios, including the cities of Fortaleza, where the exponents of athletics are trained, and Campinas, seat of badminton player Osleni Guerrero and his coaching staff. The judokas led by London 2012 monarch, Idalys Ortiz (+78kg), and tae kwon do athlete Rafael Alba (+80) remain in Salvador, and some track and field stars are still in Spain. Antonio Becali, INDER president, insisted in the multiplied weight demanded at this time by aspects such as discipline, work-rest ratio and compliance with the medical-psychological and epidemiological orientations. "The priority now is to do everything necessary to strengthen the details and prevent any mistakes that would overturn the great effort made," he said after insisting on motivation that supports the commitment of being included in the top 20 of the medal standings by nations.